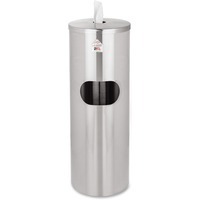 Free standing, stainless steel stand is designed to dispense 2XL GymWipes and CareWipes. It holds the bucket securely while the rubber grommet dispensing hole makes it easy for clients to grab a towelette. The bucket is completely hidden and is easily refilled or replaced by removing the top. Smudge resistant glazed finish helps eliminate fingerprints and keeps the unit looking clean and fresh in high traffic facilities. Hands free wiper dispenser includes a built in waste receptacle. Wipes are sold separately.